Last week I received three beetroots in my weekly vegetable delivery. Large, bulbous beets, still covered in their organic Scottish dirt. I knew I wouldn’t eat them – I just don’t like them much – but I knew I would save one to make juice, and at least one to make cake. I’ve never made a beetroot cake before. I’d never even tasted one, but there was no doubt in mind that chocolate could make even this ugly root taste good. My first attempt was a failure – too dry, the cake collapsed, the texture was tough and dense – so I turned to the Internet. This recipe for fudgy vegan beetroot chocolate cupcakes from Minimalist Baker looked promising. It worked beautifully as a cake, as you can see for yourself. This recipe totally delivers: it does what is says on the tin. 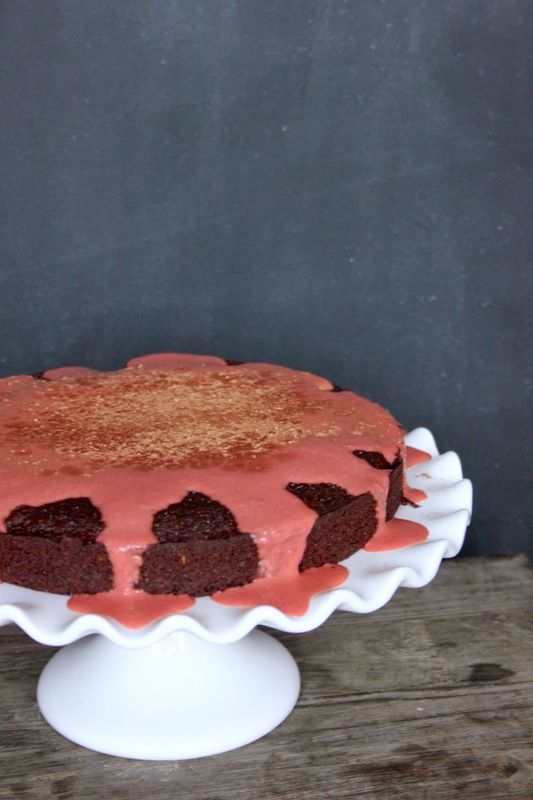 Fudgy, moist but with a good crumb; a deep earthy note that the beets add to the chocolate and makes it just heavenly. No need for ground flaxseed since the beetroot puree binds the batter better than any farm fresh eggs could. But for all its delicious darkness, this cake cries out for a pop of colour, delivered in the form of a runny, bubblegum pink icing. 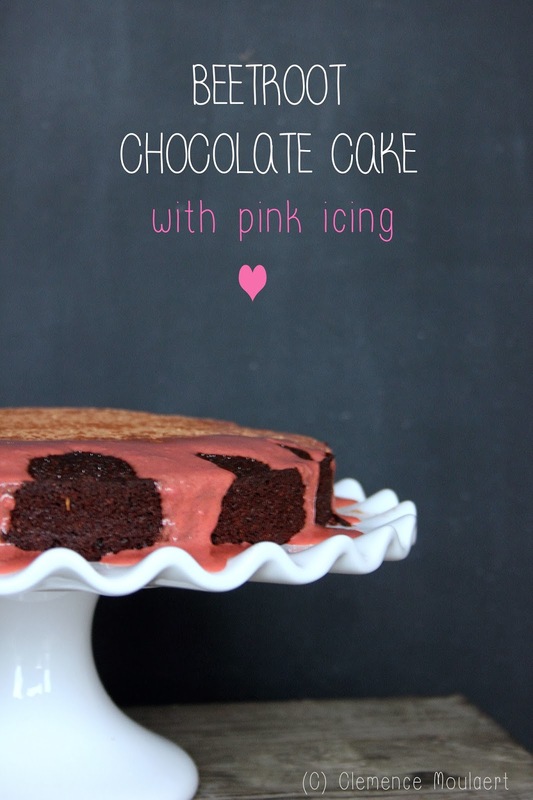 No processed food colouring required; the bright pink comes from the beetroots. Note: If you pour the icing all over the cake, as in the photos above, the icing will seep into the cake after a few hours. Better to just pour it over each slice as you serve it. Recipe adapted from Minimalist Baker’s Fudgy Beetroot Chocolate Cupcakes. Pre-heat the oven to 200ºC (400ºF). Wash the beetroot but place it unpeeled on a baking try and roast for 1 hour. Cool on a wire rack. Peel the beetroot: I impaled the beet with one fork and used another fork to scrape of the skin. Reserve some of the juices released during roasting to colour the icing. 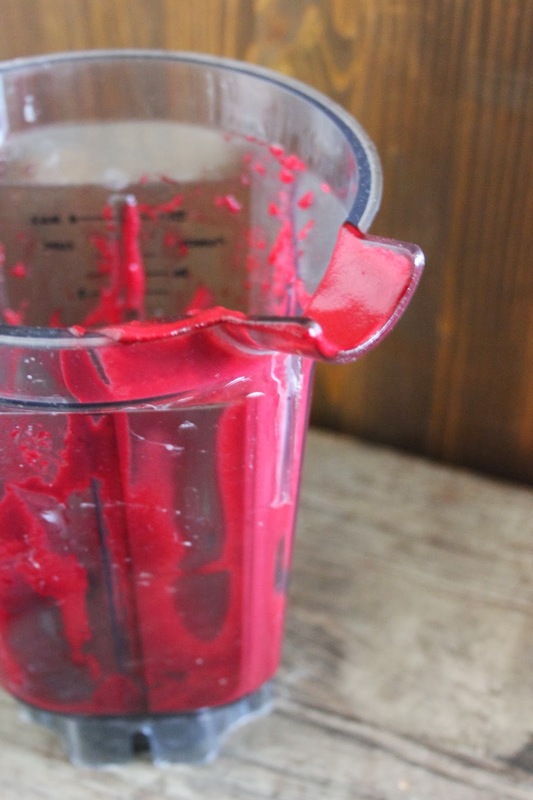 Puree the peeled, roasted beet in a food processor or blender, adding a little splash of water (only a little) to help the process along. Reduce the oven temperature to 190ºC (375ºF). Grease a 20cm (8 inch) round cake tin (pan). Curdle the milk by adding the apple cider vinegar to it. Set aside for a few minutes. Combine all the dry ingredients in one bowl and the wet ingredients in another, including the now curdled milk. Fold the dry ingredients and the pureed beetroot into the wet ingredients until no lumps remain. Pour the cake batter into the greased tin. Bake for 28-30 minutes. If you want the cake to be quite moist, I suggest baking it for 27-28 minutes. Cool on a wire rack. When the cake is completely cooled, release it from its tin. Cover with icing only when you serve. Whisk it all together until runny but thick. Pour over each slice of cake when serving. Tell me on unusual ingredient you’ve used in baked goods before, and which one do you think I should try next?